Posted on 27 Jul by Howie Law P.C. Are you suffering from shoulder pain? Have you recently received a vaccine, such as a flu shot, tetanus (DTAP or TDAP) shot or pneumonia shot in the affected shoulder? Then your pain may be caused by a shoulder injury related to vaccine administration (SIRVA). It is believed that SIRVA can occur when the person administering the vaccine uses an incorrect technique (typically administering the vaccination too high on the shoulder) or an inappropriate needle length. It is normal for your arm or shoulder to be sore for a day or two after getting a shot, but if the pain is extraordinary or continues for days, weeks or months, then you should seek medical care as quickly as possible. A shot injected too high on the arm, at the top of the arm or shoulder, can lead to SIRVA. Near the top of the shoulder, the bursa sac contains fluid and acts as a lubricant, helping the shoulder joint move easily. When a vaccine is injected into the synovial membrane of the joint or into the bursa, rather than the deltoid muscle tissue where the vaccine is designed to go, inflammation may occur. The inflammation may occur in the bursa, tendons, or the rotator cuff, causing pain and reducing range of motion. 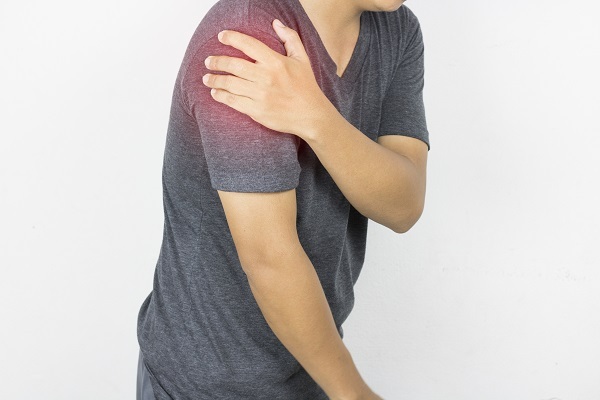 Post vaccination shoulder injuries may include sharp, debilitating pain and can include a torn rotator cuff, a torn labrum, bursitis, tendonitis, adhesive capsulitis, or frozen shoulder. Common symptoms include pain when reaching overhead, pain with reaching behind the body, and pain with reaching across the body. The pain can cause difficulty with all sorts of common activities of daily living including grooming, dressing, carrying objects, driving a car, fastening a seatbelt, and sleeping. Not only does it hurt, but diagnosing and managing SIRVA can be expensive. In some cases, the injury will be treated by physical therapy to relieve the stiffness, muscle weakness, and inflammation. Typically, physical therapy sessions may be needed 2-3 times per week for a number of weeks or even months. In most cases, a MRI is necessary to diagnose the problem, as plain x-rays will not show a SIRVA injury. A doctor may also prescribe pain medication, anti-inflammatories, or even corticosteroid injections, to relieve the inflammation and help to increase the range of motion in the shoulder. If pain medications, physical therapy, or injections do not provide relief, surgery may be necessary. In fact, Howie Law, PC represented a healthy man in his late 40’s who underwent two surgeries and had a recommendation for a third surgery as a result of a SIRVA injury. Although generally considered to be rare, SIRVA is clearly on the rise. It is an unusual problem, as it is believed that the contents of the vaccine are not the cause, but instead, the way the vaccine is injected. It is possible that, because vaccinations are now available in many places other than your doctor’s office, inadequate or inconsistent training of vaccinators may be increasing the risk of SIRVA. In addition, individuals getting a vaccine somewhere such as a pharmacy or grocery story sometimes do not remove their shirts, opting instead to just pull the neck of the shirt down, exposing only the top part of the shoulder. Improper vaccine administration is believed to be a leading cause of SIRVA. If you or someone you love have a shoulder injury that may be the result of a vaccination, you may have a claim for damages under the National Vaccine Injury Compensation Program. For more information on your legal options, please contact us. The attorneys at Howie Law, PC know and understand SIRVA injuries. We have helped our SIRVA clients recover millions of dollars in compensation, and we are here to help you. This entry was posted in SIRVA. Bookmark the permalink.